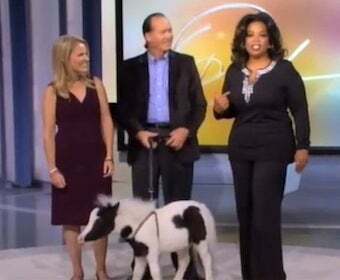 Today Oprah's guest was Einstein, a five-month-old horse who is only 20" tall and weighs 47 pounds. His owners keep him in a barn in their backyard along with their two miniature goats, and say he's "every little girl's dream." Einstein's title is still up for debate, since Thumbelina, the current record holder, is shorter due to dwarfism. Whatever Guinness decides, Einstein still has a leg up on Thumbelina — Oprah's never fed her carrots or inquired about the size of her poop.